Nathan Byrne reckons Wigan Athletic are having to contend with a totally different pressure this season than last. But he’s extremely confident the side has it in them to once again achieve their goal – which means consolidation in the Championship. This time last year, Latics were kicking for home on their way to securing the League One title in a photo-finish from Blackburn. While Rovers have flirted with the Championship play-offs this term, Latics have found the going slightly tougher after a bright start. But a positive result this weekend at relegation rivals Reading would give them valuable breathing space over the bottom three. And Byrne is confident they’ll finish the campaign with a familiar flourish. “Last season there was pressure on us, but for a different reason,” he told the Wigan Observer. “This year it’s been pressure at the other end of the table, and it’s another challenge. 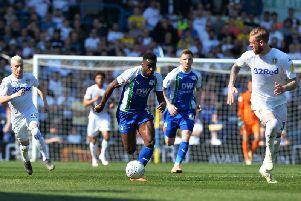 That pressure could be eased if Latics show up at Reading on Saturday, with the Royals desperate to drag their opponents back into the dogfight. “There’ll probably be a few more butterflies in the belly on Saturday, with the stakes for both sides,” Byrne acknowledged. “But you’ve got to try and keep doing what you do on a weekly basis, nothing out of the ordinary. “Hopefully we’ll turn up on the day and five a good account of ourselves. “If you win more individual battles than your opponents, chances are you’ll win the game. A draw would probably not be the worst result at the Madejski for Latics, given the league standings and the upcoming fixtures. But Byrne has given up second-guessing what may or may not happen in this crazy division. “More than probably any league in the world, the Championship is so unpredictable,” he recognised. “If I was a gambler, I certainly wouldn’t gamble on the Championship, that’s for sure! Byrne has shown his versatility this term as he’s moved around to secure game-time. The arrival of Reece James (inset) has meant most of his opportunities have come further forward. But he was restored to the backline against Middlesbrough last weekend, with James employed as an extra midfielder, and did his job as Latics snuffed out the threat from one of the promotion chasers. “It’s massive to get a clean sheet at this level,” Byrne recognised. “You’re giving the lads at the other end the chance to do their jobs and win the game. “The worst you’re going to come away with is a point.